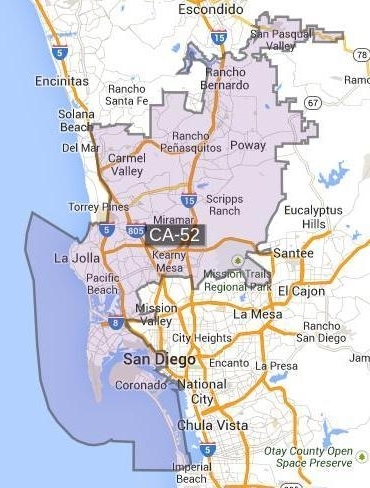 The district includes coastal and central portions of the city of San Diego, including neighborhoods such as Carmel Valley, La Jolla, Point Loma and Downtown San Diego; the San Diego suburbs of Poway and Coronado. Incumbent. As his endorsements suggest, Peters is a moderate Democrat, liberal on social issues (reproductive rights, gun control, LGBT rights) but also business-friendly -- he got support in the primary from the Chamber of Commerce but not the San Diego Labor Council. His district has gone from purple to blue over the past few years. Just a few years back, the 52nd was considered a critical and flippable district for both parties. This time out the GOP couldn’t find a candidate with significant name-recognition. Republican Qudrat highlights issues of national security and his qualifications as a former counter-terrorism prosecutor for the military. He has assured Breitbart News that he supports Trump’s policies on immigration and terrorism and that he opposes sharia law "anywhere in the world." This contest is between a conservative/moderate Democrat and a Trump Republican.